Before being given the green light on a seminal Jimmy Garoppolo trade, John Lynch discussed the Patriots’ other prominent quarterback with Bill Belichick. It was not a long conversation. The then-first-year 49ers GM did not receive the answer he wanted regarding a Garoppolo deal when he spoke will Belichick early in the 2017 offseason, and he said he then asked if the Patriots would trade Tom Brady. Kyle Shanahan was told at the 2017 Combine Garoppolo wasn’t available, but at the trade deadline, he received a phone call from Belichick and quickly agreed to send the Patriots a second-rounder for the player who is now entrenched as the 49ers’ quarterback of the future. Shanahan had Kirk Cousins on his radar prior to that move. Brady enters his 19th season with the Patriots and is set to start Week 1 for a 17th straight season. This figures to be an amusing footnote associated with Lynch’s GM legacy. John Lynch has had an enviable career in professional sports. He was selected in the first round of the 1992 Major League Baseball draft by the expansion Florida Marlins, and he threw the first pitch in Marlins’ organizational history as a member of one of the team’s minor league affiliates, the Erie Sailors. His Sailors jersey resides in the National Baseball Hall of Fame as a result, but he was later selected in the third round of the 1993 NFL Draft by the Buccaneers, and he is probably pretty happy that he ultimately chose to pursue football. Lynch spent the first 11 seasons of his NFL career with Tampa Bay, and during that time, he established himself as an elite safety. He became one of the most feared tacklers in the league, and he was heralded for his leadership both on and off the field. His playmaking statistics leave a little to be desired, as he tallied just 26 interceptions and 13 sacks in his 15-year career (although he did not become a full-time player until 1996, his fourth year in the league). That could be one of the reasons why he is still on the outside looking in at the Pro Football Hall of Fame, but his play went beyond raw stats. He was always someone that opposing offenses had to plan around, and his work earned him nine Pro Bowl bids and two First Team All-Pro selections. He was also a key figure in the Bucs’ only championship, helping the team capture Super Bowl XXXVII. Tampa Bay released the two-sport Stanford athlete following the 2003 campaign, and he was snapped up by the Broncos. Despite switching from strong safety to free safety, Lynch maintained a high level of play with his new club, as he was selected to the Pro Bowl in each of his four seasons in Mile High. He served as Denver’s defensive captain during the 2006-07 seasons, and on this day in 2007, he and the Broncos agreed to terms on a renegotiated contract that would keep him with the team for one more year. He considered hanging up the cleats after the 2007 campaign, but Broncos owner Pat Bowlen convinced him to come back for one last hurrah. Even at age 36, though, Lynch expected to be on the field for every snap, and it became clear during the 2008 training camp that he would not be used in sub-packages. He ultimately left the team and was signed by the Patriots, though he never played a regular-season game for New England, which released him just a few weeks later. Lynch formally announced his retirement in November 2008, and he subsequently enjoyed a successful stint as a color commentator for Fox. He was surprisingly named GM of the 49ers in January 2017, and while the jury is obviously still out on his tenure as an NFL executive, the early returns are promising. Taking over a club in the midst of a full-scale rebuild, Lynch managed to acquire the team’s quarterback of the future in Jimmy Garoppolo last October in exchange for a second-round draft pick. This offseason, he (briefly) made Garoppolo the highest-paid player in NFL history, even though the East Illinois product has played a grand total of seven games in his professional career. Lynch’s fate with the 49ers will, of course, be tied to Garoppolo’s, but he has done as well as could be expected thus far. Indeed, San Francisco is being mentioned as a fringe playoff contender, no mean feat considering the roster that Lynch inherited. And while the playoffs may still be out of reach in 2018, one more good offseason of work could get the 49ers back to postseason play. This date 11 years ago therefore marked the beginning of the end of Lynch’s on-field career, but his involvement with the league after retiring as a player has been pretty notable in its own right. He is a member of the Buccaneers’ Ring of Honor and the Broncos’ Ring of Hame, and he remains a viable candidate for the Pro Football Hall of Fame. And while it’s certainly too early to engage in these types of discussions, maybe he’ll one day get into Canton as an executive even if he doesn’t make it as a player. One of the top dominos to fall in free agency this offseason will be the future of Kirk Cousins. The Redskins have used both the transition tag and franchise tag on the signal-caller in the last two years, respectively, and their intentions this offseason remain unknown. One option would be to again use a tag on Cousins and then trade him to another team, NBC Sports’ Rich Tandler writes. In theory, Tandler states, Cousins would agree to a deal with another team but would not sign an offer sheet. He would then be receive the transition tag from Washington, who would then trade him to the agreed upon team. Tandler notes the pros to the deal would be an assurance to Cousins that Washington wouldn’t match an offer, the Redskins would receive compensation for his departure and the other team would get their franchise quarterback without signing him to a heavily front-loaded contract. Of the teams who would potentially be interested in such a deal, the Browns, Broncos and Jets seem like the most obvious candidates to get something done. It’s still early in the offseason, but the Cousins situation will be among the most interesting and pivotal of the offseason. Cowboys wide receiver Ryan Switzer underwent arthroscopic surgery to remove bone spurs from his left ankle, the team reported. Primarily deployed as a kickoff and punt returner in his rookie season, the North Carolina product is expected to assume a heavier workload on offense in his second season. The Cardinals are looking to hire Titans defensive line coach Nick Eason for the same position, AZ Central’s Kent Somers hears (Twitter link). The position was previously held by Brentson Buckner for the last five seasons. Eason played 10 seasons in the NFL and has been with the Titans since 2014. 49ers general manager John Lynch has stated often that he envisions Jimmy Garoppolo as the quarterback in San Francisco for the foreseeable future. Lynch confirmed this week that steps have been taken to ensure that happens, reports the San Francisco Chronicle’s Eric Branch writes. The chances of Garoppolo playing somewhere other than the Bay Area in 2018 are slim to none. If a multi-year deal cannot be quickly reached, the team is sure to use the franchise tag on the signal-caller who has yet to lose as a starter in the NFL (7-0). Just days after Terrelle Pryor was placed on season-ending injured reserve, the Redskins’ pass catchers received another blow on Wednesday. The team’s star tight end Jordan Reed was ruled out for the team’s Thanksgiving tilt with the Giants, according to Kimberly Martin of the Washington Post (Twitter link). The oft-injured Reed, who was labeled as questionable by head coach Jay Gruden an hour before the announcement, will miss his sixth game of the year. Reed also missed four games in 2016 and two during his breakout 2015 season. There are few better tight ends than Reed when he is on the field. Of the 11 players at his position to record 250 receptions since 2013, he is the only one to average at least five receptions per game. The team will once again turn to Vernon Davis in the division clash on Thursday night. Staying with San Francisco, Lynch also believes defensive end Arik Armstead has a bright future with the team despite missing 18 of 32 career games with an injury, according to Matt Barrows of the Sacramento Bee. “We think he’s a fit with what we are and who we are going forward,” Lynch said. Though he is a fit, Armstead will need to find a way to stay on the field to stay in the 49ers’ plans. Matt Prater has been the Lions’ most valuable free agent signing in the last five seasons, writes ESPN’s Michael Rothstein. Though he has stiff competition from Golden Tate and Glover Quin, the veteran kicker is without a doubt in the mix for the honor. John Lynch acknowledged the 49ers‘ effort to add some picks for the 2018 picks may have had an ancillary motivation. The 49ers signed Brian Hoyer and Matt Barkley in free agency and used a third-round pick on Iowa’s C.J. Beathard. While the new San Francisco GM hopes Hoyer or Beathard can be the franchise quarterback he covets, he’s aware of the higher-profile passers expected to be part of next year’s talent pool and doesn’t sound averse to adding another passer in 2018. Josh Allen (Wyoming), Josh Rosen (UCLA) and Sam Darnold (USC) headline that group, with Louisville’s Lamar Jackson lurking as a wild-card threat with obvious top-flight athleticism. The 49ers acquired 2018 third- and seventh-round picks during draft weekend, the first in the Mitch Trubisky deal with the Bears, and traded a 2018 fourth-rounder to the Broncos for running back Kapri Bibbs. A player the Broncos selected hours after making that Bibbs trade, Chad Kelly remains in recovery from right wrist surgery. The former Ole Miss quarterback did not throw during Denver’s offseason program but is targeting a return to making passes in two weeks, the rookie said during an NFL Network appearance. This year’s “Mr. Irrelevant,” Kelly comes to Denver with a higher pedigree than most such seventh-round picks but will be behind Trevor Siemian and Paxton Lynch going into camp. This will likely be a developmental year for Kelly. While the Broncos are set to hold a quarterback competition, the Vikings have a long-term dilemma at the position. None of the three ESPN.com reporters surveyed believe the Vikes should offer Sam Bradford a long-term extension. Bradford’s two-year deal he signed with the Eagles expires at season’s end. Jeff Dickerson and Rob Demovsky would encourage a franchise tag scenario similar to Washington’s Kirk Cousins course of action, while Michael Rothstein said a Bradford deal makes sense only if the 29-year-old signal-caller would be amenable to a one- or two-year pact. Teddy Bridgewater re-emerged to do some on-field work in late May, although the recovering passer has yet to return to official Vikings practice. He has a complex contract situation, but the Vikings did not pick up his fifth-year option. The Colts allocated much of their linebacker funds to adding outside ‘backers, but they did make some investments to help patch some holes inside. They added Sean Spence and Jon Bostic and used a fifth-round pick on Northwestern’s Anthony Walker. Despite Bostic being signed to a one-year deal worth just $690K and having missed the 2016 season due to injury, Colts.com’s Kevin Bowen projects he will claim one of Indianapolis’ starting inside linebacker jobs. Bowen tabs the other spot to be wide open. Bostic hasn’t started more than one game in a season since starting eight for the 2014 Bears. John Lynch has vouched for Colin Kaepernick‘s desire to play football throughout this offseason, but the new 49ers GM doesn’t think all of his peers believe him. Lynch said it would be in Kaepernick’s best interests to communicate these desires to remain in the league publicly. 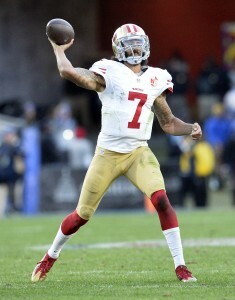 Kaepernick remains a UFA despite several less accomplished quarterbacks landing backup jobs. While he visited the Seahawks and has maintained a public profile on social media, he hasn’t spoken out about his football career this offseason. Late last month, a 49ers employee questioned Kaepernick’s commitment to football, saying he only wants to return to stay relevant. Here’s more from the Western divisions, first shifting to the 49ers’ Los Angeles-based rival. During Day 2 of the draft, the Rams traded down from No. 37 to 44 and picked up an extra third-round pick from the Bills. 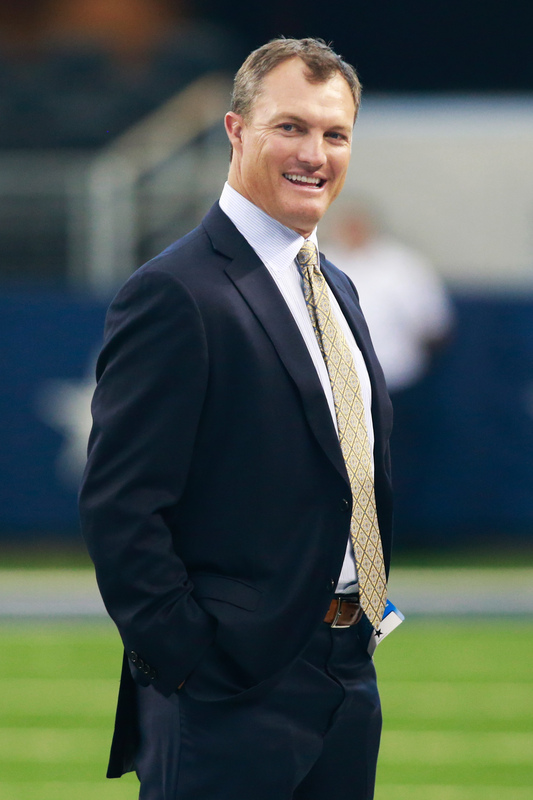 Sixth-year GM Les Snead said during Amazon’s “All or Nothing: A Season with the Los Angeles Rams” that he doesn’t get too attached to second-round talents because he’s confident offers will be there to trade out of the spot and stockpile more selections. “You don’t want to pick early second [round] often,” Snead told new HC Sean McVay (via Alden Gonzalez of ESPN.com). “But when you’re picking early second, never fall in love with a player. You’ll always get an extra third[-round pick].” The Rams selected safety John Johnson with that third-round pick. McVay’s presence and the addition of multiple wideouts this offseason will help Jared Goff, with Nick Wagoner of ESPN.com noting that McVay’s newer-age offense will benefit last year’s No. 1 overall pick more than the Rams’ previous “antiquated” attack. The Rams ranked last in total offense by more than 40 yards last season, at 262.7 per game. The team added Robert Woods in free agency and used third- and fourth-round picks, respectively, on Cooper Kupp and Josh Reynolds. The Chargers signed a 10-year lease at their new facility in Costa Mesa, Calif., Jack Wang of the Orange County Register reports. The team is committed to lodge there for at least five years, per Wang, who adds that the Bolts have until the end of this month to depart their facility at Chargers Park in their previous city. Costa Mesa is currently serving as the Bolts’ temporary home, but the team hasn’t ruled out staying there on a longer-term basis. Wang reports the Chargers are still looking to secure permanent headquarters elsewhere in the region. John Lynch confirmed today the 49ers would have released Colin Kaepernick if he didn’t opt out of his contract, the first-year GM said (via Mike Florio of Pro Football Talk). The 49ers would have had to carry a $14.9MM cap charge if Kaepernick had stayed on the team. A meeting occurred between Kaepernick and the Lynch/Kyle Shanahan power structure where Shanahan said he wanted to run his same offense that thrived with the Falcons. The dual-threat quarterback wasn’t a classic fit for that scheme. The team soon brought in Brian Hoyer, with whom Shanahan worked with the 2014 Browns, and didn’t see Kaepernick making sense as his backup. “We both sat down and under that current construct of his deal, it was a big [cap] number,” Lynch said. “Kyle had a vision for what he wanted to do, and one thing I think Kyle was very clear and I think Colin appreciated, is that Kyle has an idea of how he’d play with Colin Kaepernick. But he preferred to run the exact offense that he ran in Atlanta last year that was record-breaking in this league. And if you change it for the quarterback, you change it for everybody on that offense. Kaepernick remains without a team but has visited the Seahawks, with some league insiders believing he will end up being Russell Wilson‘s backup. Lynch also squashed the notion that the 29-year-old doesn’t want to return to football, one that came from 49ers sources earlier this month. John Lynch‘s first offseason as the 49ers general manager may be remembered for the hefty contracts he handed out to a fullback and a former Super Bowl MVP. The organization committed more than $23MM in guaranteed money to fullback Kyle Juszczyk and linebacker Malcolm Smith, leading some pundits to wonder whether agents were looking to take advantage of the new, inexperienced executive. Of course, that sentiment may not be entirely fair, as Lynch has added a number of free agents on favorable deals, including quarterbacks Brian Hoyer and Matt Barkley, wide receivers/offensive weapons Pierre Garcon, Aldrick Robinson and Marquise Goodwin, tight end Logan Paulsen, linebacker Dekoda Watson, special teamer Don Jones, and kicker Robbie Gould. “But then it kind of got to even another step and we had to all stop and kind of look at each other and go, ‘OK. This is getting real.’ And that’s when we kind of came up the philosophy he’s not just a fullback; he’s an offensive weapon … I’m gonna trust my instincts on what the guy brings, not necessarily what the rest of the market sees him as.